1 Bedroom Flat For Sale in Middlesex for Offers in the region of £260,000. 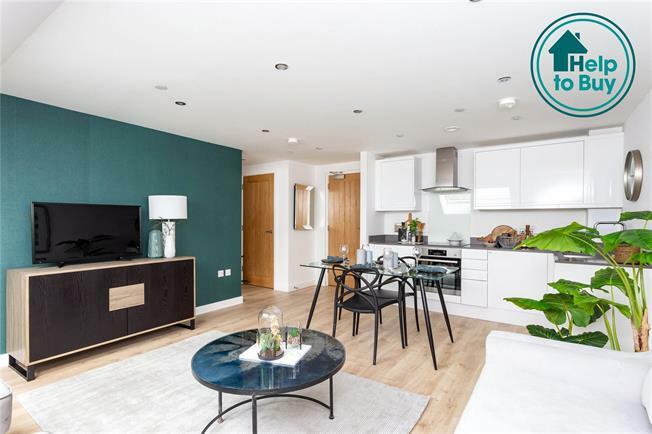 A unique collection of 39 contemporary 1-Bedroom apartments located in the centre of Stanmore Broadway. You will benefit from having all the local amenties on your doorstep including a number of supermarkets, restaurants, boutiques and other various shops catering for all needs. Stanmore's Jubilee line station is just a short walk away with easy access to Central London within 30minutes and road links accessible via the M1, M25 and A1. There is also excellent bus links to all surrounding areas. - High gloss handleless fitted Kitchen with soft closing doors, Quartz stone worktop, inset stainless steel sink with contemporary taps, AEG electric fan assisted oven and hob, glass splashback, fully integrated fridge, space for a washer/dryer. Chrome electric points above worktops. Under pelmet low energy lighting to wall units. - Modern white sanitaryware Bath/Shower Room with chrome taps, Bath with chrome shower mixer and clear glass side panel (where applicable). Shower with chrome pivot door and space save stone tray (where applicable). Mirrored wall cabinet with integrated lighting, anti-steam mirror and infrared touch sensor. Porcelain wall and floor tiles. Chrome heated towel rail. - High quality Oak laminate floor to Living areas, Kitchen and Hallway. - Luxury 80% wool carpet to Bedrooms. - Touch screen video entry system. - Parking available to purchase.